Nepal is a small Himalayan landlocked country between India and China and is an important habitat of mega-faunas including Asian elephant, Elephas Maximus. It is a protected species in Nepal however conflict arises due to residential and migratory herds of elephants and increase of human population. 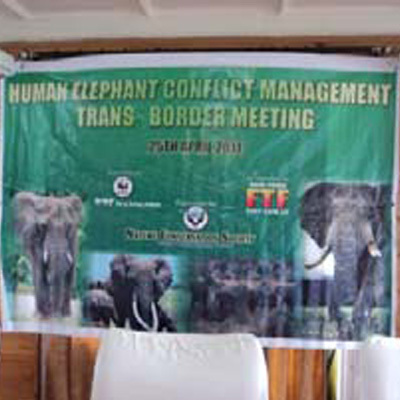 Of all the regions, Jhapa district experiences the most intense human-elephant conflict. Jhapa is located on the eastern border of Indian state of West Bengal. The main objectives of this project are to provide education for secondary schools student on environmental conservation, to build awareness, promote local cultures and tradition and to develop the tourism sector in the eastern border region through regional international festival. This project is led by Nature Conservation Society, which has been instrumental in minimising the effect of human-wildlife conflict in the region since 2009.